The Lessons of Wood - learn Ed Wood's true message! Ed Wood is more than just a director and he is more than just a person to worship. Ed Wood is also a deep mental process, an inner sense of self that, when Ed is followed and worshipped correctly, will better one's life. By using the holy teachings of life within Ed Wood that have been written exclusively by Reverend Steve Galindo, founder of Woodism, one who fully believes in Ed Wood and His divinity will find ways to make their lives better, calmer and more productive. Each Lesson of Wood features messages of how to better your lives within Ed Wood's love. They are funny, helpfull, sad, happy, guiding and a million other things much like Ed Wood himself could not be pinned down with one description. 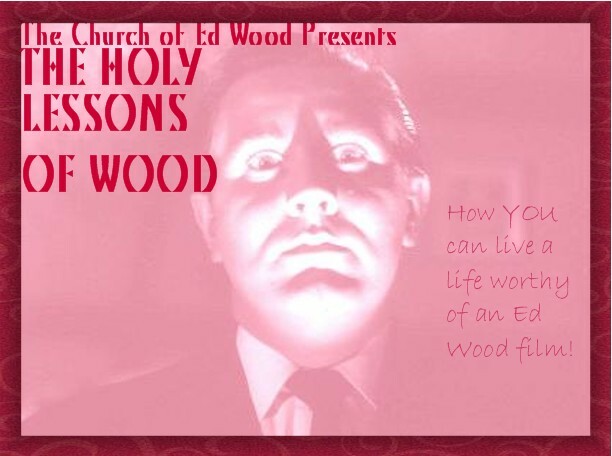 These heavenly sermons are MANDATORY for anyone expecting to worship Ed Wood as a savior. SINCE 1997, THE CHURCH OF ED WOOD'S HOLY FOUNDER REVEREND STEVE GALINDO HAS BEEN BUSY WORKING ON THE HOLY TEACHINGS OF LIFE WITHIN ED WOOD, THE LESSONS WHICH WILL EVENTUALLY BECOME THE FOUNDATION OF THIS ENTIRE CHURCH and LAY THE FOUNDATION FOR THE EVENTUAL HOLY BIBLE ACCORDING TO WOOD! EACH ONE IS DIRECT, TO THE POINT, AND THEY LAY THE FOUNDATION FOR THE TENNETS AND SPECIFIC BELIEFS OF WOODISM! The Lessons of Wood are indeed an incredible thing. Through the pages you can get a very good understanding, not just of the evolution of Woodism but also of the evolution and maturity of Woodism's founder, Reverend Steve Galindo. The first few, lessons one through six or so, are the serious ones, written straightlaced and starkly, with no humor and all seriousness, written in the hopes of Woodism being taken seriously, and when written scared away many Woodites who were looking for a funny Ed Wood page. The second half, lessons seven through twelve or so, are the more humor oriented ones. The later ones, lessons sixteen through currently, are more dwelling into Reverend Steve's personal live with still a strong emphasis on Ed Wood and Woodism. Very compelling reads, all of them. And there is no last lesson, no end to the lessons and their wisdom. Reverend Steve has promised that, much like Ed's spirit, these Lessons of Wood are neverending and will continue being written until the end of time. LESSON 19 - THE FIRST LIST OF WOODISM SAINTS! LESSON 23 - SEPT. 11th, 2001 AND HOW ED WOOD SAVED THE WORLD! LESSON 24 - EVERYONE, EVEN ED WOOD, ASKS FOR HELP SOMETIMES. LESSON 27 - THE IMPORTANCE OF POP CULTURE IN SOCIETY AND A BLASTING ATTACK ON THE PHIL ARMS MINISTRIES. LESSON 28 - A DETAILED, IN-DEPTH LOOK AT A FEW OF THE CHURCH OF ED WOOD HOLY DAYS AND THEIR IMPORTANCE. LESSON 29 - REVEREND STEVE'S "ED WOOD SAVES" TATTOO. LESSON 30 - A LOOK AT REVEREND STEVE AND ED WOOD'S LIFELONG DREAMS. LESSON 31 - LOOKING AT SADNESS, WAR, DANCING IN THE KITCHEN AND HOW TO BE PROUD OF YOURSELF. LESSON 32 - AN EXCLUSIVE VIDEO LOOK AT THE WORLD'S ONLY ED WOOD BOARD GAME! ALL OF THE LESSONS OF WOOD ARE BEAUTIFUL TEACHING OF THE CHURCH'S POLICIES, BELIEFS, PRACTICES, AND TRADITIONS. THEY ALL SERVE AS HELPFUL WAYS THAT WE CAN ALL BE LIKE ED WOOD. IF YOU ARE HONESTLY, SERIOUSLY INTERESTED IN STARTING ON THE ROAD TO BECOMING A WOODITE, THEN THESE LESSONS ARE THE FIRST PLACE TO TURN TO. THESE CREATE THE CORNERSTONE TO WHICH, ONE DAY IN THE FUTURE, YOU MAY UNDERSTAND WOODISM AND BUILD A TEMPLE TO ED WOOD WITHIN YOUR OWN HEART! Reverend Steve promises to you, the loyal Woodite, that no matter what the future holds, he will continue with these holy Lessons of Wood, constantly writing newer and newer lessons until he finally dies, whenever that may be. The Holy Lessons of Wood will never be finished, however. When Reverend Steve dies, new and thought-provoking lessons will still be written, thus constantly expanding the power and nature of Woodism and Ed Wood! SPECIAL NOTE: The move from our old geocities site to EDWOOD.ORG was a long and tiresome one, mainly being done by just two people. So as you read and reread through the holy "Lessons of Wood" you will note a lot of mistakes - a lot of old HTML and old links and pics. Please be aware that yes, indeed, we know that there are a lot of mistakes out there and we are working on fixing them but it will take a while.